In this dynamic and entertaining MP3 lesson, Rev. 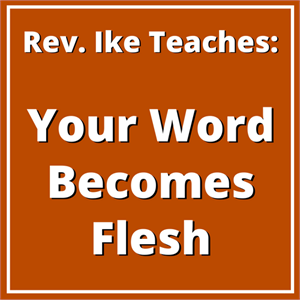 Ike shows you how to use the power of YOUR WORD to create the life you desire. Rev. Ike teaches this life-changing truth, that your "WORD" is what you think, feel and SAY about yourself – and your WORD always comes into visibility as your EXPERIENCE! Your word is GOD to You! Every condition in your life – the things you WANT and things you DON'T WANT – comes about because of your word. In this empowering lesson, you’ll discover how to apply "The Law of I AM" to your word – to manifest GOOD HEALTH, HAPPINESS, SUCCESS & PROSPERITY. You'll learn how your incorrect use of your word may be causing you unhappiness, sickness, lack and limitation – and how to avoid misusing your word! You'll gain new self-awareness as you discover how your – often subconscious – feelings and beliefs about yourself (your word) – are manifesting in your outer world! You'll learn how to use the power of your word to stay youthful and healthy! You'll learn why you must tell your feelings how to feel, and how to do it! Rev. Ike teaches you how to "Fake it till you make it!" You'll participate in powerful affirmation treatments, repeating after Rev. Ike the new empowering thoughts and beliefs that will reach deep down into your subconscious and reprogram your mind to a new way of thinking! As always, Rev. Ike teaches you these profound truths with his classic wit and humor that will keep you smiling! You'll have a new handle on life! When Rev. Ike gets through with you, you're going to be a different person. When you go through this experience with him, you'll deal with problems and situations in a whole new way! Order this eye-opening, empowering MP3 today!